Using great digital resources you can go on amazing field trips without ever leaving the classroom. 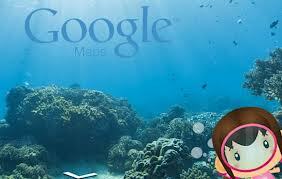 Google Street View – Oceans: 71% of Earth’s surface is ocean, and there’s a ton to learn about the vast ecosystems in the oceans across the globe. Go walk on the ocean floor and try to identify as many ocean plants and animals as you can. Google Sky: Google uses amazing images from observatories and from the Hubble Space Telescope for you to visit space. Explore the magnitude of space and be inspired by this vast universe. GeoGuessr: After one session you will be addicted to this fun world-wide guessing game. When you visit GeoGuessr, you’re set down at a random spot in Google’s Street View. Walk around and check out surroundings, until you’re ready to make a guess as to where you are. Select the spot you think you’re at on the map, and see how close you were. Let’s put your geography skills to the test. Where is…? is another good game that presents you with a city and players have to click the map to guess where the city is located. TRY IT! Google’s Street View imagery takes you to Kenya where we can virtually walk along with elephants. In the new imagery you can see elephants, zebras, lions, leopards, and more. Visit anywhere in the world and record your findings. Decide how you will share your experience with your classmates. maybe make a brochure? Visit Genius Hour Resources for additional ideas.